Also in this issue was a look at President-elect Barack Obama's actions around the economic crisis titled "Why He Just Can't Wait". It chronicles the steps that have already been taken to prop up the economy prior to the Jan 20, 2009 inauguration and shows someone who appears to be really stepping up to a huge challenge. 1. "Don't Panic, Retirees" from money writer Dan Kadlec which among other points makes the argument that the market should be going up and people should invest now to realize those gains. 2. The last-page essay from Nancy Gibbs about the current rush to collect items related to the Barack Obama election victory. Gibbs is a very poignant writer and I really enjoyed this piece that takes a broader look at collections as a whole and how as she puts it "collectibles are the memory of the moments that make us who we are." Just finished reading "Zero Days"... a pretty interesting book by Barbara Egbert, who took a sabbatical from writing for the San Jose Mercury News to hike the Pacific Coast Trail from Mexico to Canada with her husband and 10 year old daughter. I came across the general story from reading an excellent newspaper article by Egbert for the Mercury News after the hike. I wish I could find it to post here, but at least for the time being will have to simply say that it was a really good piece and I enjoyed it more than the full-length book itself. While the topic of the through hike for a family that included the youngest person to ever hike the entire distance was interesting, I wasn't a huge fan of the narrative structure of the book that had chapters organized as topics rather than narrative following the duration of the hike. This said, it was an interesting story and I have to give huge credit to both the then 10 year old daughter who completed the journey and the parents who did it along with her. Further details about the Egbert family can be found on their website, PCT Family. - HBO: In a March 2008 issue, BusinessWeek did an interesting profile "From Hitmen to Hitless" of the management issues at cable channel HBO as they attempt to replicate the success of "The Sopranos". - "Heroes", "Lost", "Buffy the Vampire Slayer" & other sci-fi shows: From it's May 2008 issue, Fast Company Magazine published the story "Rebel Alliance" about the successful young creators of hit sci-fi television shows... and how many of them were influenced by Joss Whedon, creator of "Buffy the Vampire Slayer". - "This American Life": In May 2008, Time Magazine published "10 Questions for Ira Glass" with the creator of the popular NPR radio show... that has since been adapted into a Showtime series by the same name. - "Mad Men": I don't actually have a specific article linked, but have come across enough mentions of the AMC show that I'm interested in watching it from the series beginning. As is almost always the case, there was some excellent writing in Esquire Magazine's latest issue... it's "Best & Brightest" from Dec 2008. The cover story was written by Esquire writer-at-large Chris Jones, the object of my "writing man-crush". An in-depth profile of Vince Vaughn, it features the same type of great prose that Jones seems to deliver with each piece. From this same issue, Jason Fagone writes a fascinating profile on iconoclastic video-game programmer Jason Rohrer and his most well-known creation, "Passage". Available for download here, it's a small game with old-school pixelation that has been trumpeted at video game conferences by some of the biggest game designers in the business. Rather than having more bells and whisltes than the current hot titles on the market, the game has enough depth in it's plot to bring both Rohrer and other industry bigwigs to tears... all in the five minutes it takes to play. I recently finished "The Hard Way" by Mark Jenkins and celebrated reading this tale of mountaineering exploits and excursions to the remote corners of the Earth by... catching a cold and staying inside all week. Well, while this is a bit of an aside to the book itself, it actually does relate. When I read Jenkins' tale of his various adventures, I admire him for the desire and heartiness to visit these dangerous locales, but don't actually want to myself. What I can say, though, is that even though I may not wish to climb a mountain after reading about someone else doing it, I am probably a bit motivated to get out and go camping or hiking... and to do so with my son as he gets older. So, that takeaway combined with the experience of being entertained by the interesting content combined with excellent writing (from someone who's doing what they love)... yep, it adds up to time well spent having read the book. Time's "Invention of the Year" piece highlighted the various product breakthroughs from in the last year. In the purely entertaining category, the list included the online video "Dr. Horrible's Sing-Along Blog" from "Buffy the Vampire Slayer" creator Joss Whedon and starring Neil Patrick Harris. The 43-minute 3-part musical has since crossed over from mere online video to now having a DVD in the works. On the more serious front, Time's #1 Invention of the Year is a $399 DNA test that people can use to determine their susceptibility to various genetic diseases. While the test (and current science behind available to the consumer gene testing) has it's detractors, it's still a fascinating concept from the Google-backed startup 23andMe. Contained in this issue of Time was a profile of Michelle Obama, wife of now President-elect Barack Obama (whom I've written about a few times). Written by Curtis Sittenfeld, author of the novels "Prep" and "American Wife" (a fictional look at the life of current first lady Laura Bush that I previously reviewed), it's a fascinating look at this woman now very much in the public eye. Also in this issue was a James Poniewozik commentary about the ABC Television show "The View" and what it provides to the public. The opinion piece makes the interesting assertion that "The View" is good television precisely because of it's inherent bias. Poniewozik's point is that watching the show you know where each member of the panel comes from... and how they likely feel about Democrats or Republicans among other topics. As a result of this, people watching the show are able to listen to very different perspectives... while knowing whatever preconceived notions might be behind those views. This becomes particularly interesting to me when you consider the oft-made argument that the media is biased towards a particular political party. My feeling is that I don't agree with this argument because I think that the media is not a large entity (like "The Borg" from Star Trek), but rather an collection of writers and broadcasters all of whom have their own particular feelings and leanings. I think we can expect our network news anchors to come across as completely objective, but don't think we need to ask that of each and every person reporting information to us. Thus... you have the interesting dynamic that "The View" provides. There was a couple of very different articles of interest from the November 2008 issue of Fast Company Magazine. First was a profile of Microsoft Live Labs head Gary Flake and his efforts to innovate at the software giant. While it will take years to measure the true legacy Flake leaves at Microsoft, early returns have been interesting with the 3-D photo application photosynth as an example. Also from this Nov 2008 issue was a Q&A session with Costco cofounder and current CEO Jim Sinegal. Among other things, it feature's Sinegal's views of how a big publicly-traded retailer can (as some assert) be overly generous to it's employees and still prosper (perhaps due in part to said generosity). About a year apart, Time Magazine published two issues whose cover stories shared a common theme. The first was from Aug 2007 and contained a cover story written by the excellent writer David Von Drehle. Titled "The Myth About Boys" it examines the held in some circles notion that today's male youth are going down the wrong path and pretty much concludes... things are fine. One interesting point the article touches on is the held in some circles idea that boys are not spending enough time exploring on their own, but rather spending all their recreational time in highly structured team sport environments. Drehle doesn't completely disagree with this assessment, but does offer examples of how many boys are spending time on wilderness exploration and makes reference to the wildly popular "The Dangerous Book for Boys" activity guide book written by Conn and Hal Iggulden. 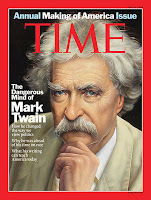 The second issue was Time Magazine's July 2008 annual Making of America special report... focused on Mark Twain. Pieces range from Managing Editor Richard Stengel's "The Mark of Twain" introducing the issue and it's chosen subject to an in-depth look at the man titled "Mark Twain: Our Original Superstar" among several other pieces from the entire issue. Great writing on interesting subjects from both issues. As to the connection between the "Myth About Boys" piece and Mark Twain himself... well, I think the guy who wrote "The Adventures of Tom Sawyer" and "The Adventures of Huckleberry Finn" would have been quite interested in what Von Drehle had to write. Just finished reading "The Last Lecture" by Randy Pausch. It was written along with Jeffrey Zaslow after Pausch's lecture about life and preparing to die (Pausch passed away recently from cancer) to his Carnegie Mellon students. The book itself is somewhat interesting, but it's primary impact was to make me want to actually watch the lecture itself and to learn more about some of the work that Pausch did while teaching. Two of the outputs of his efforts are the "Entertainment Technology Center" and "Alice". The ETC is a master's degree program in what sounds to be incredibly cool stuff... robotics, video games, animation, etc. and Alice is a software program that teaches computer programming. Just finished reading "Saved" by acclaimed hockey writer Jack Falla. It's a fictional look at a goalie in the NHL and blends in stories of family, commitment and life around a hockey tale. Jack Falla passed away in September 2008 at the age of 64. His career included stints writing for Sports Illustrated and more recently teaching communications at Boston University. Some of his most well known writing was about his backyard rink in Massachusetts and can be found in his book "Home Ice: Reflections on Backyard Rinks and Frozen Ponds" or in a condensed version at this link to the story "How and Why to Build a Backyard Rink". Early in 2008, Falla also came out with the book "Open Ice: Reflections & Confessions of a Hockey Lifer" discussing his life spent around the sport he loved. This being said, "Why Barack Obama is Winning" is a very insightful piece from Joe Klein in the Nov 3 issue of Time Magazine. - "What I've Learned" by Glenn Fitzpatrick, 46-year old Esquire editor diagnosed with ALS... from the March 2008 issue. - "I Do Not Have a Death Wish" from writer David Vann. This story was from the Dec 2007 issue of Esquire and it's a first-person account of Vann's preparations to attempt a round-the-world sail of a homemade boat. The follow-up to this introduction can be found here on the Esquire site. One of the compelling things here is that it's such good first-person writing of an interesting story. - An obituary of sorts of writer W.C. Heinz by my favorite living writer, Chris Jones (previously posted about here as well as here). Jones references Heinz's short story "Death of a Racehorse".